In Ephesians 6:12, we are given a rare glimpse into a realm where the real battle for our soul is being waged. From this passage, we can draw at least three descriptions of spiritual warfare that form the acronym W.A.R. 1. The "W" in W.A.R. stands for wrestle - "For we do not wrestle against flesh and blood..."
According to Thayer’s Greek Lexicon, the word “wrestle” comes from the Greek word πάλη (palé) and means “a contest between two in which each endeavors to throw the other...” In other words, spiritual warfare is first described as hand-to-hand combat, an individual struggle. This is not to say that we alone or not part of a larger army (the church). But it is to say that we are first individual soldiers, with individual battles, then we are part of a larger group. Unlike other translations that dilute the meaning of the word “wrestle” by using the word “struggle,” the New King James retains the Holy Spirit’s choice of a Greek word that emphasizes hand-to-hand combat. Application: While the church can be a safe place filled with collective support and encouragement, most battles are won or lost on the individual level. This is a very sobering thought! It is a realization that could prompt hopelessness if it were not for the words of Romans 8:9-16. From this marvelous passage we can learn many things, but none more important than this - we are not alone in any battle. Spiritual warfare might present itself as an individual wrestling match “against spiritual hosts of wickedness in the heavenly places” (Ephesians 6:12, NIV), but as long as we acknowledge the partnership between our spirit (personal responsibility) and the Spirit of God (Divine empowerment), no enemy is too great! PART 2: The "A" in W.A.R. stands for AGAINST - "...against spiritual hosts of wickedness...."
It’s interesting to note that the word “against” is used five times in this single verse. It must have significance to the Holy Spirit. 1. The repeated use of this word emphasizes the reality of our fight. This is not some nebulous struggle against some undefined enemy. We are up AGAINST an actual enemy, with actual weapons, who poses an actual threat that is far more real than physical death. We are up AGAINST a wicked nemesis who threatens our very eternity. 2. The word “against” is used repeatedly to emphasize the struggle. Spiritual warfare is not an inconvenience. It is not a sickness or even a handicap. Spiritual warfare is the very source of every hurt, every tragedy, and every violent act that has ever occurred since Genesis 3. 1. “strongholds” - Satan doesn’t just want to influence us, he seeks a stronghold within our value system from which he can govern our entire life. 2. “arguments” of “pretension” - From the Garden until now, Satan has continued to be the master of half truths and the great manipulator of tantalizing arguments which are designed to dilute the authority of God. 3. “every thought” - Once Satan has control of our thoughts, his stronghold is secure. Lessons on mental discipline are perhaps the most needed instructions given by the church. Q: How many sermons or Bible classes have you ever heard on this topic? While each of these military maneuvers can be devastatingly successful, Ephesians 6:12 says that our weapons can “demolish” all of them because they are sourced in “divine power.” It’s a God weapon! 1. Satan is not God’s equal. He never has been and he never will be. The yin yang does not represent a biblical principle. The key to neutralizing Satan’s forces is simply the “divine power” of God. Please read Roman 8:5-17 and Acts 2:38. 2. Satan knows he is not God’s equal and his greatest fear is that we will know it. This is why self-study and the personal pursuit of truth is so very important. This is why the damnable half-truth doctrines of Catholicism, Calvinism, and Reformed Theology must be exposed. Knowing God is a very personal journey and it must not be predicated on the “wisdom” of men. Human wisdom is defenseless against the wiles of Satan and when pretentious church leaders suggest that their doctrine should be used as a supplement to Scripture, Satan’s stronghold is nearing completion! There is no denying it, we are up AGAINST a very real enemy and only by effectively wielding the “divine power” can we overcome. The location of these wicked forces is both intriguing and intimidating - they abide in “heavenly places” or REALMS. As citizens of an earthly realm which is limited by physical sight, the mention of another realm seems almost science fiction in nature. However, I refer you back to the five uses of the word “against” in the previous point. The Holy Spirit wants us to know that “heavenly realms” are real. They are inhabited and are often very dangerous places. From this passage, 3 phrases must be acknowledged in order to understand “heavenly realms” and the warfare being discussed in Ephesians 6:12. 1. “His intent” - The antidote to spiritual conflict does not come from some random military maneuver. God pre-planned His final assault on evil and pre-knew the people who would carry it out. Study Acts 17:26-27. 3. “the manifold wisdom of God” - When a person gives serious consideration to the size of the assignment given to us in the Great Commission, “go into all the world” (Mark 16:15, NIV), it can seem a little overwhelming. But when Ephesians 3:10 and 6:12 are added into this task, the assignment becomes nothing less than humanly impossible! We, the church, are not only responsible for influencing our realm (“the world”), but we are also called to impact the “heavenly realms.” Our battles right now are influencing, inspiring and, in some ways, even evangelizing the inhabitants of the spirit realm. Wow! Without “the manifold wisdom of God,” this would be impossible. The greatest contest of life is all summed up in our exaltation or devaluation of the “manifold wisdom of God.” When we stand our ground, God and His values are celebrated both on earth and in the “heavenly realms.” When we concede to the enemy, His values are slandered. Yes, the responsibility is a tremendous one, but failure is nothing less than catastrophic. We must not give Satan the opportunity to shame our Commander in Chief in front of the world or the heavenly hosts. From Ephesians 6:12, we can conclude at least three important things about spiritual warfare. Our primary involvement is characterized as hand to hand combat (“wrestle”). Our enemy poses a threat that is even more real than physical death (“against”). Our actions on the battlefield effect not only the physical plane, but even reach into the spirit world (“heavenly realms”). 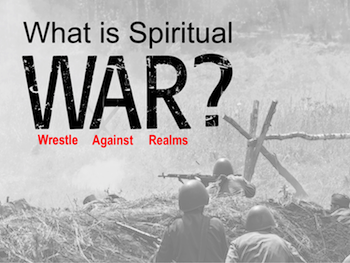 Back to Top of "What is Spiritual Warfare?"